You don’t need to be a Warhammer 40K fan or figurine collector to appreciate its presentation and be captivated by its shattered universe. RTS veterans Relic Entertainment know this as well as anyone, imbuing the multiplayer beta’s intro cutscene with a biblical quality; Eldar, Orks and Space Marines tearing into each other in a misty symbolic space of perpetual conflict. Even without context, it sends shivers up the spine. 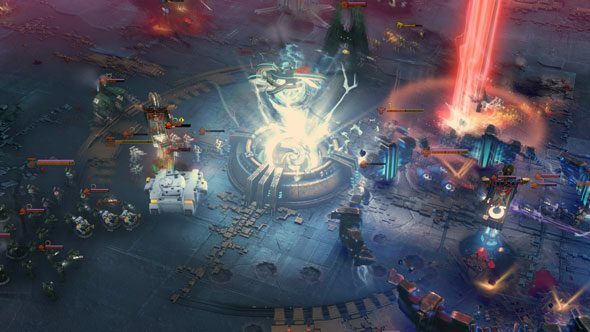 Read more: pit yourself against these great PC strategy games. 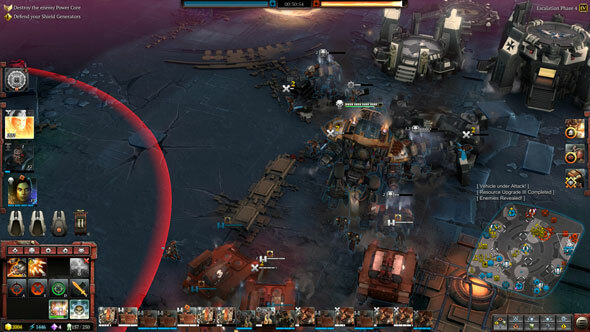 Of course, the profundity of the trailer makes way for absurdity in the multiplayer, as the three factions can fight alongside each other in traditional team-based RTS battles. I got to fight several such battles, giving me a decent feel for what’s what in store for DoW’s new dawn. The rules are simple: take over pre-designated resource points, create buildings and bases pretty much anywhere on the map, then attack the other team. To wipe out the enemy, first you need to destroy their shield generator, followed by a giant laser-beaming turret thing, before finally smashing the power core. In my first couple of games i presided over the Space Marines – the safe option. You can customise your army with different colour variants to reflect the different Space Marine chapters – blue for Ultramarines, green for Dark Angels, grey for Space Wolves etc. 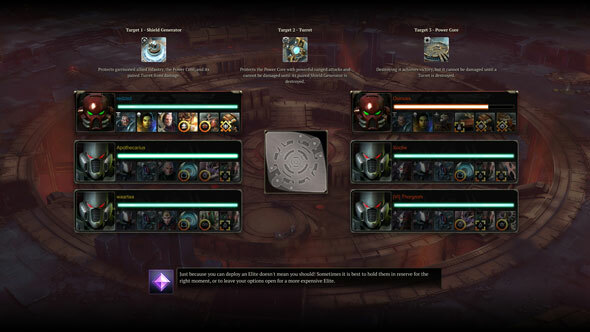 – as well as pick three elite units and three abilities. I went for the grizzled hammer-wielding Gabriel Angelos, Kill Team Ironmaw, and Imperial Knight Solaria, who stomps around in a glorious giant mech. My first battle was a 3-v-3 on a perfectly symmetrical, circular map, with two teams of Eldar alongside me. Their fast-moving infantry went straight about harrying the enemy with persistent rhythm-breaking attacks on their resource points, giving me time to think about what the hell my strategy would be. I quickly learned that building and moving troops from my starting base wasn’t viable, so attacked a poorly guarded enemy resource point, around which I began establishing a forward base close to the enemy power core. My teammates and I seemed to have a solid unspoken strategy in which I was to amass an army while they kept the enemy busy all over the map with speedy guerrilla-like attacks. But our serendipitous plan was almost torn apart when the enemy, led by Dreadnoughts and Gabriel Angelos, charged my under-construction forward base. Angelos leapt into my forces with his special hammer thwomp, dismembering several of my marines and sending others flying (the bloody carnage left over after battles is a nice touch).They destroyed the heavy infantry barracks I was building, and after a struggle, wiped out my frontline heroes. While the bulk of my army fell apart, my defensive setup held up; I’d upgraded my Listening Post before the battle, making it a decent little damage-dealer, and towards the rear of the base I had five artillery tanks barraging the enemy enough to make them flee. The skirmish was a swing moment in the battle, and my victory, for all its sacrifice, gave me time to bolster my forward base. Having purchased all the unit upgrades possible in the meantime, and with my battle experiences rewarding me with my highest-level elite unit, I summoned Imperial Knight Solaria, alongside my two other elites. Supported by my trusty artillery control group, I pushed on to the enemy base from the south, aware that their armies had their hands full with my Eldar chums in the north. It was a massacre of flying metal and limbs – storm troopers flying into the thick of the enemy, Solaria’s double chainguns decimating them, and the artillery concentrating on defensive enemy structures. I didn’t need reinforcements, and felt pretty smug when one of my allies arrived in an Eldar walker to witness me performing the coup-de-gras. Couldn’t have done it without my pals’ efforts elsewhere on the battlefield, of course, but I allowed myself to indulge in the pleasure of delivering the killing blow. While a fairly classic and perhaps predictable RTS, DoW III is brimming with character and oozing with that gritty Warhammer 40K style that makes it, in my eyes, the best universe to realise in an RTS game. The comical quips of the Orks, creaking industrial environments, unique soundtracks for each race, and the thrill of experimenting with the eclectic Elite units make DoW III a fun place to be, even if it hasn’t pushed any boundaries in my time with it so far.